The promise of 3D. Brought to life by LOCTITE®. 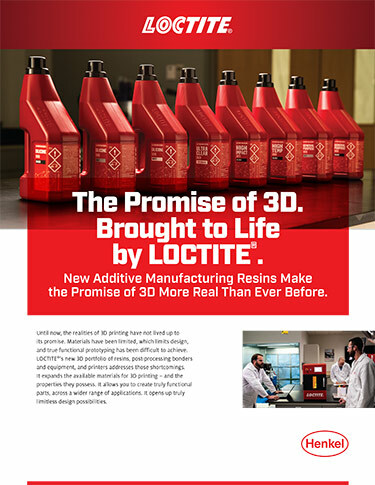 LOCTITE brings new substance to the promise of 3D printing with their new, industrial-grade 3D printer and a complete range of differential manufacturing resins. Designed for truly functional prototyping and speedy, multi-component production, LOCTITE's portfolio of resins and equipment turns your 3D vision into reality. Why choose LOCTITE for 3D printing? take 3D to the next dimension. Delivers maximum optical clarity and high print resolution. Rigid output with exceptional accuracy for general prototyping. Designed for snap-fit components and increased flexibility. Characterized by high HDT and good print resolution. Engineered to increase durability under impact extremes. 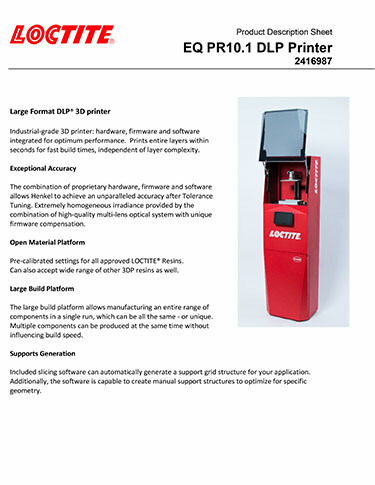 Get a move on prototype production with LOCTITE's industrial-grade 3D printer. Redefine your expectations with LOCTITE 3D printing solutions.